My job at The Journal-News has given me some pretty unique life experiences so far. I’ve been able to cover UFC events, watch state championship games and meet elite athletes. I’ve also been able to blend some of those opportunities in with my beautiful wife Mary and I’s quest to give our five-year-old daughter Grace as many unique experiences as possible since she was diagnosed with the rare degenerative genetic condition INAD, which carries a pretty grim prognosis as most children with INAD don’t live to see their tenth birthday. NFL Pro Hall of Famer Kellen Winslow in his new Grace scarf. Thursday, April 20, was one of those instances, even though neither Grace nor I were there for the part that involved our journey. That Thursday afternoon, I returned to my alma mater of Lincolnwood High School to cover an awards ceremony for a special young man. Ryan Poggenpohl, a junior at Lincolnwood, was a finalist for the U.S. Army Pro Football Hall of Fame Award for Excellence, and I couldn’t think of a better candidate to represent my school and my hometown of Raymond. Ryan’s success as an athlete and student are commendable, but his passion for military service is above and beyond. He has worked incessantly on achieving his dream of joining the U.S. Naval Academy and serving his country, something that I don’t know I could have even imagined at his age. 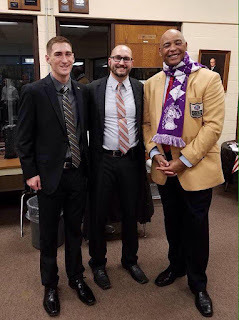 As part of the award ceremony, the school was paid a visit by Kellen Winslow, Sr., representing the Pro Football Hall of Fame. I knew a little about Winslow, who is among the greatest tight ends to play the game, but I wasn’t sure how the ceremony would go. I’ve seen other speakers just go through the motions and you forget what they’ve said before you reach the parking lot. I’m happy to say that Winslow wasn’t one of those individuals. Before and after the event Winslow was gregarious, quick with a smile and more than willing to pose with anyone who asked if they could get their picture with him. He was one of the last people out of the gym that afternoon, talking to a few students and even ribbing Lincolnwood senior K.J. Wolff for wearing his Terry Bradshaw jersey to the event. My highlight at the time was that I got a chance to tell him a story that my Uncle Joe has been telling me for years. Joe’s brother John was the same age as Winslow and was aggravated that when awards were being passed out after the season, he was a first team pick, while John was a second team selection, despite Winslow playing just one year of high school football. It was fun to get to rehash the story to him and it will be one of two things I will always remember about the awards ceremony. The other came from a small section of his presentation, which spoke about life experiences. That could be the mantra of our Grace-Filled Journey. We know that our time with Grace may be limited so we want to make sure that we have as many life experiences as we can while we still have her. Life is the totality of our experiences. When we look back at Grace’s life, we won’t just remember the struggles of dealing with this awful disease. We won’t just remember all the good things and forget the trying times. We will remember everything. And it will help us cope and get through life without her, if that day ever comes. That small section of the speech would have been enough to make the day special for me, but it became way more special on the drive home. As I was getting back to Hillsboro I received a text from my buddy Kendal Elvidge, who is the principal at Lincolnwood High School, a fact that still seems extremely weird. Kendal has been taking photos throughout the school year of positive things at Lincolnwood, using the hashtag #InspiredByGrace, with a Grace-Filled Journey scarf present in each photo. I knew he was planning on doing one with Kellen Winslow and Ryan Poggenpohl, but I didn’t expect what transpired during their photo session. My jaw hit the floor. I had considered bringing Grace to the event or talking to Winslow about our journey, but I didn’t want to take anything away from Ryan’s experience. For Kendal to take a few seconds to share our journey means the world to us. It was only a brief moment, but for Mary and I, it will always be something we remember. Life is the totality of our experiences and this one made our life just a little bit better.